We’ve found a new fun food show on BritBox – The Hairy Bikers. 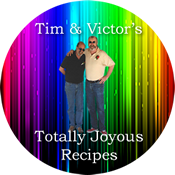 These guys are hysterical – and they actually can cook and bake! One of the great things about them is they take it serious – but don’t take it serious. It’s definitely my approach and attitude towards food – have fun with it. They had one series that was their Bakeation – where they traveled around Europe baking different regional items. They would locate someone who was known for the item, join them in their kitchen, and make it. It made for some fun TV. 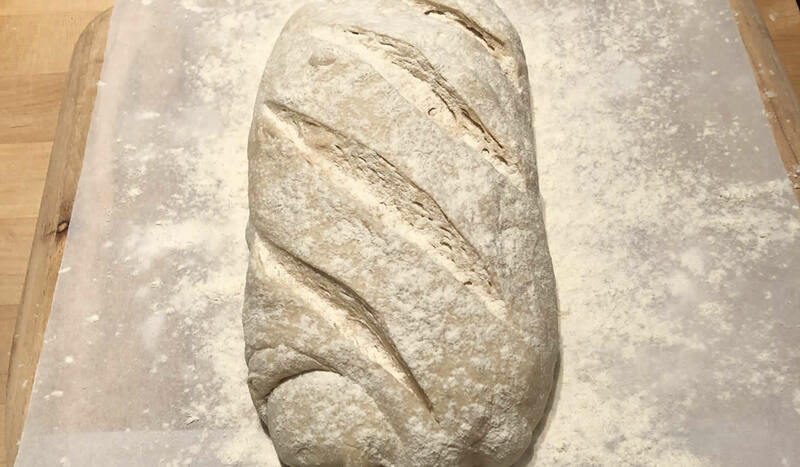 I plan to make several of their recipes and decided to start with a rustic Spanish bread – Pan Rustica – made with a starter. I made the dough in the mixer because it was a timing thing – I made the dough after we got back from the gym and before we took off to the dump to get rid of a truckload of branches and trimmings from the yard. One of those multi-tasking things so the dough would be ready when we got back. It’s a fairly loose dough, so kneading by hand would be a lot more time-consuming. For the starter, pour the water into a medium bowl and stir in the sugar. Lightly stir in the yeast and leave in a warm place for about 10 minutes or until a beige foam floats on the surface. Stir in the flour to make a thick paste, then cover with cling film and leave at room temperature for 24 hours. At the end of the 24 hours the paste will smell yeasty and slightly fermented – a bit like beer. For the bread dough, pour the water into a jug and stir in the sugar. Lightly stir in the yeast and leave in a warm place for about 10 minutes or until a beige foam floats on the surface. Stir the flours and salt together in a large bowl, then make a well in the center and add the yeast and water mixture, the starter dough and the oil. Mix with a wooden spoon and then with your hands until the mixture comes together and forms a slightly lumpy and sticky dough. If the dough feels a little dry, add another tablespoon or two of water. Transfer the dough to a work surface and knead for a good 10 minutes until it’s smooth and elastic. As you knead, push the dough away from you with the heel of your hand to stretch it as long as possible, then fold it back towards you. This will help strengthen the flour and trap air bubbles inside the loaf. Resist the temptation to add too much extra flour as it could make the dough dry. You should feel the dough change in texture as you work, so don’t be afraid to be fairly robust with your stretching and folding. Put the dough in an oiled mixing bowl, cover it loosely with oiled cling film and leave it to rise for about an hour or until it has doubled in size. Line a baking tray with parchment and dust with flour. Loosen the dough with a spatula and tip it on to the baking tray. Stretch the dough very gently until it’s about 30cm/12in long, then fold it in half and stretch again. Do the same thing twice more. This should help to give the dough a more holey texture. 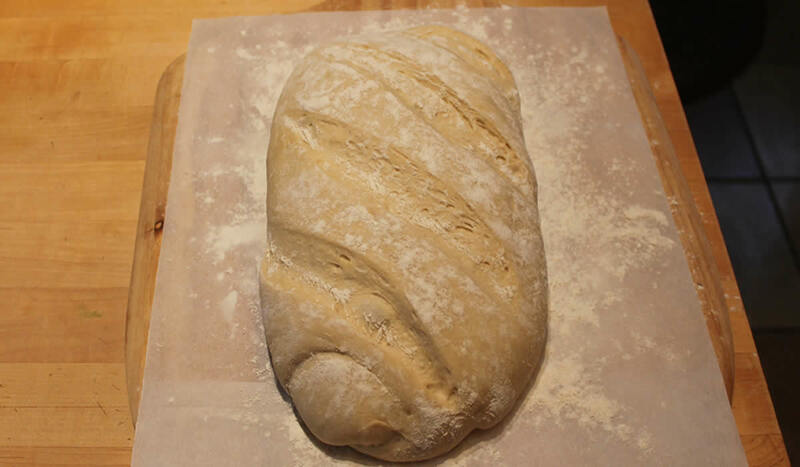 After the third stretch, shape the dough into a long loaf shape and slash the top a few times with a sharp knife. Dust with a little flour and leave to prove in a warm place for 45–60 minutes or until it has risen again and feels light and puffy. Preheat the oven to 240C°/450F°. Bake the loaf for 20–25 minutes or until golden-brown and crusty. The base should sound hollow when tapped. Cool on a wire rack. It’s amazing how many variations one can get from flour, water, salt, and yeast. 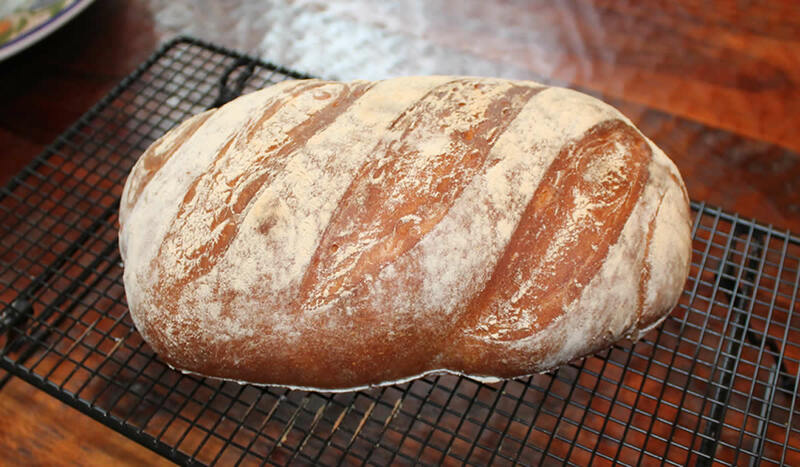 And this really is one of my favorite kinds of bread – simple, but with tons of flavor! The crumb is soft and the crust is slightly chewy. I think next up will be a loaf of rye bread from Norway.